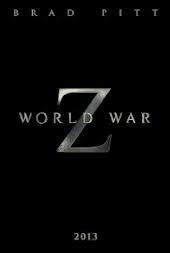 I’ve not read the book that World War Z is based on, but I have heard very good things. Given the popularity of the book and zombie narratives in general, a film adaptation was pretty inevitable. Featuring Mr Brad Pitt means that this has gotten even more hype. It has been in production for a while and here is the first official trailer. What do you all think? Looks rather massive in budget and scope to me. Has the potential to be something really quite special. Or a bit meh. We will find out either way next year. Watched the trailer about a week ago and really liked it. It’s a passion project for Pitt and hopefully that will show. It has been dealyed and faced many setbacks but I hope that is not a bad sign. Have you read the book man? No, I haven’t. How about you? No, I haven’t either. Heard pretty good things though. I’ll try to check it out before the movie. I like the trailer, the scope as Fernando says, the passion from Pitt for the project. I’m expecting good things, but I’m not expecting it to, pardon the pun, set the world on fire. Yeah I am really unsure how it will turn out. Have you read the book? Pitt is good like that, really getting behind films. Think he had a lot to do with “Killing them Softly” getting made.